There was much international news in mid-March, although little of it was encouraging for those who prefer peace to war, handshakes to sabre-rattling, and cooperation to confrontation. Space Station about 250 miles over the Pacific Ocean. The mission was successful, technically and professionally, but did not in any way diminish Washington’s anti-Russian bias or its determination to militarize space. A forecast for the second quarter of 2019 by the analytical think-tank STRATFOR reflects the Washington Establishment’s line that “Military competition between the United States and Russia will prevail…” but does not record that the military budget of the United States is vastly more than that of Russia, or that, as headlined in the 2018 Report by the Stockholm International Peace Research Institute, world defence expenditure “falls sharply in Russia, but rises in Central and Western Europe.” As is well-known, the US will spend 716 billion dollars on its military in 2019, but what is not publicised by the Western media is that Russia’s 2019 outlay is 45 billion dollars. 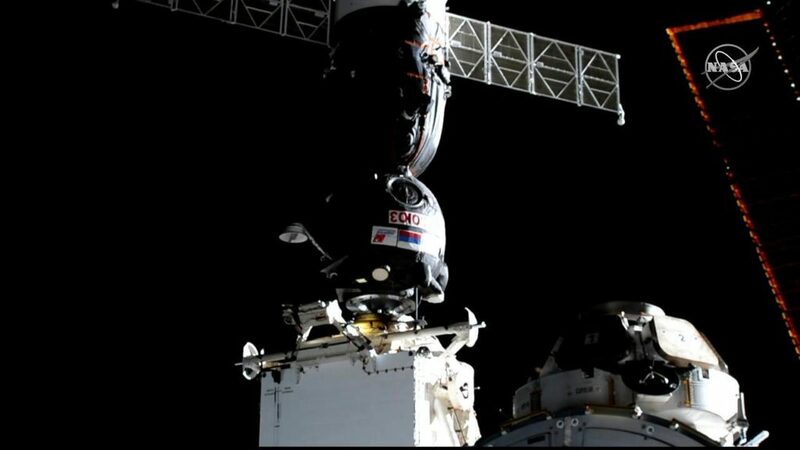 Naturally he didn’t mention that at the very time he uttered his confrontational challenges there was close cooperation in air, land and space between the US and Russia whose astronauts were “able to freely manoeuvre” in harmony, adding to world knowledge and engendering trust by jointly conducting research projects in the International Space Station. It is a difficult to imagine why there could be any objection to a treaty aimed at “prevention of the placement of weapons in outer space,” but the White House responded that it opposes any treaty that seeks “to prohibit or limit access to or use of space.” Indeed the White House said that such a treaty would be impossible to enforce because “any object orbiting or transiting through space can be a weapon if that object is intentionally placed onto a collision course with another space object. This makes treaty verification impossible.” The US continues to be resistant to any treaty forbidding deployment of weapons in space. It was therefore unsurprising when Trump put forward his plan for militarising space in March last year, and in August tweeted “Space Force All the Way!” Then he declared on February 19 that “we’re investing in new space capabilities to project military power and safeguard our nation’s interests, especially when it comes to safety and defense” and signed a directive ordering the Pentagon to create a Space Force as the sixth branch of the military. The result of his brainwave is that the US is going to “project military power” in space, which is directly contrary to “the basic principles related to the peaceful use of outer space” noted in the Outer Space Treaty. In the words of the US Administration, “space is now a warfighting domain just like the air, land and sea” so it’s goodbye to a future of harmonious exploration and scientific research in the regions beyond our globe. It had been hoped that the Treaty would go far to assist in “maintaining international peace and security and promoting international co-operation and understanding” but Washington has no intention of agreeing to any international law that would prohibit extra-terrestrial weaponisation, and Trump’s Space Directive has now set the seal on Washington’s preparedness to confront in space as well as by land and sea and in the air. Stand by for Space War.